Just last year, SurveyMonkey found that 58 percent of men said there were no more obstacles for women in the workplace. In reality, their perception could not be further from the truth. From the #MeToo movement to the perpetuating gender pay gap, it is clear that we have yet to reach a place of gender equality at work. One of the reasons that gender equality seems to be out of reach is the disparity of women working in certain roles and fields. Earlier this year, Entelo examined our database of half a billion candidates in efforts to quantify the Gender Gap in Technology. We found that today, women represented only 18% of all tech roles and only 10% of tech roles at the executive level. When we conducted a similar analysis for VC, the numbers unfortunately reflected the same trend. 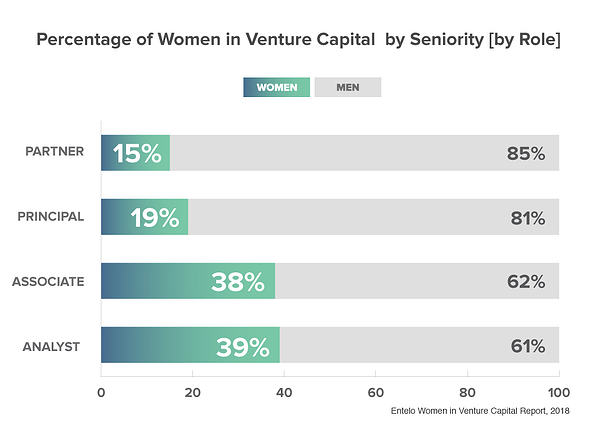 The more senior the VC position, the lower the proportion of women fulfilling those roles. 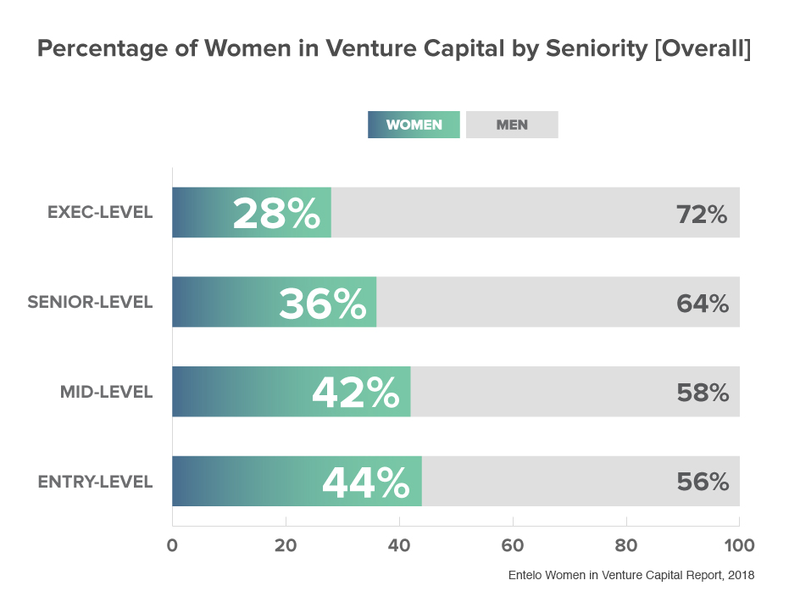 At the entry level women are in 44% of VC roles, and much like tech, the percentage drops to only 28% of roles at the executive level. There’s no question women in venture capital are underrepresented, the question is why? Many experts point to the systematic sorting of men and women into different jobs. Of course these decisions are based on individuals own free will, however cultural factors have major influence over the jobs that women and men gravitate toward. Elise Gould, an economist and co-author of the report “Women’s work” and the gender pay gap from the Economic Policy Institute, said that the choices men and women make when it comes to career path are not made in a vacuum. Some of the factors that drive women to choose certain roles are the expectations of American mothers. Jobs with more flexibility, although well suited to parenting, also usually pay a lower salary. Although the numbers depict a less than ideal reality, there are things that companies can do to course correct. Ensuring that the hiring process is fair and unbiased is critical to increasing the number of women in VC, or any industry for that matter. Companies can use technology like Entelo to reduce unconscious bias by removing demographic information that might sway a hiring manager’s perception of a candidate. Though technology will not solve the problem alone. Practicing inclusion begins long before a candidate is in the door. During the hiring process, organizations highlight how important inclusion is to their organizations. Interview questions that map back to company values or ask directly about prior experience with diversity and inclusion training or programs can help communicate to candidates how important inclusivity is at a company and help them see a future with the organization. And because most of the issues women face in the workplace are interconnected, addressing the gender pay gap is integral to also addressing the disparity of women in certain roles. Research shows that employer policies that embrace salary transparency can help eliminate hard-to-justify gender pay gaps, and can play an important role in helping achieve balance in the workplace overall. While we would like to recognize that women have come a long way when it comes to equality in the workplace, there is still a lot of work that needs to be done. The best place to start, as with any problem, is the source. Sourcing using tools that allow recruiters to reduce bias and build diverse candidate pools are key to ensuring workplace gender equality in the future.